Regardless of whether it is a lay person or a professional rescuer, the AHA/ERC guidelines place a greater emphasis on the importance of CPR and advocate the prompt initiation of effective bystander CPR to significantly reduce mortality due to out-of-hospital Cardiac Arrest (CA). HeartSine can now provide a device to support these guidelines by the introduction of the HeartSine samaritan PAD with CPR Advisor model 500P. User-friendly. Easy-to-understand visual and voice prompts guide a user through the entire process. Highest level of dust/moisture protection. The samaritan PAD has a rating of IP56, providing the 500P defibrillator with the highest level of protection from dust or moisture ingress in the industry. Durable. The samaritan PAD 500P resists shock and vibration and carries a ten-year unit warranty that demonstrates the reliability of this quality unit. Advanced technology. The samaritan PAD 500P utilizes proprietary electrode technology, advanced and stable firmware, and proprietary SCOPE™* Biphasic Technology (an escalating and low-energy waveform that automatically adjusts for patient impedance differences) to assess rhythm and recommend defibrillation if necessary. Low cost of ownership. 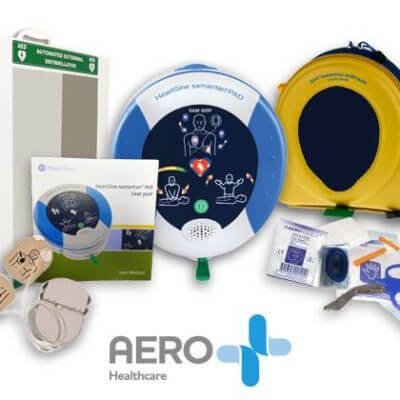 Cartridge has a shelf life of four years from date of manufacture, offering significant savings over other defibrillators that require separate battery and pad units.